Tourism bosses in Cleethorpes are urging jet-skiers to act more responsibly after two teenage girls almost drowned at the resort. The 15-year-olds were picked up during an air sea rescue on Saturday after getting into difficulties on jet-skis. People who use the vehicles must now be vetted before being allowed out on the water in Cleethorpes. Resort manager David Reed said: "We are hoping to prevent a repeat of this kind of accident." 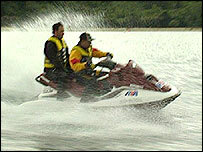 Other new safety rules imposed by North East Lincolnshire Council include checks that jet-skiers have insurance. People using the machines must also be trained and over the age of 17. Coastguards said one of the girls rescued on Saturday, Michaela Crawford, was about 15 minutes away from death. Michaela, an experienced jet-skier from Sheffield, had gone out during the morning with her friend Brook Mah.